They plan to sell a relatively small number (200-1000) of fairly expensive machines ($5,000-$10,000). The point here is we are not dealing with millions of $10 nodes, which is really the vision of IOT. There might be as many as a dozen machines installed in each location. Users of these machines need to monitor them remotely. The manufacturer would also like to monitor them for diagnostics and customer support. The machines can be connected to the Internet at the install sites. These machines are installed at various locations where the manufacturer doesn’t have much control over the network (firewall, filtering, which ports are blocked, etc). The machines don’t need to talk to each other. It should be relatively difficult to hack into a machine and mess up what it is doing. Data will be mostly going from machines to the cloud. There are several ways to address these requirements, but one of the simplest today is for each machine to talk to a server in the cloud, and then users monitor and control the machines through a web application running in the cloud. The web application can be designed to be viewed on both personal computers and mobile devices. HTTP is the most compatible with existing network infrastructure, and you are pretty much guaranteed HTTP will work. 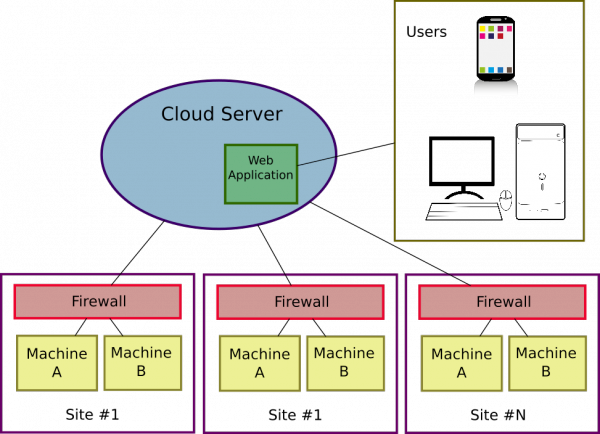 If a web browser works, then machines in this scenario should be able to send data to the cloud. Stateless HTTP/REST will traverse firewalls and NAT systems easily. Again, web browsers work. Because the Machines initiate the connection to the server (users are not connecting directly to a browser on the machine), the machines are much easier to secure. Thy don’t even need any open ports. Most of the security effort in this system only needs to be focused in one place (cloud server). HTTP provides well understood authentication and encryption mechanisms. There are other applications where MQTT or CoAP might make more sense. In a system connected via cellular modems where data is very expensive, you might want to consider CoAP, because it can use UDP which eliminates the overhead of TCP/IP, which is significant (both MQTT and HTTP require TCP/IP). Especially if you have 1000’s of nodes, and are trying to keep the monthly usage of each one under 5MB. If the various machines need to talk to each other, then MQTT would be a good choice. While I’d like to use MQTT or CoAP, in this application I’m going to recommend they stick with HTTP(S). Even though MQTT might be more convenient to work with, the support costs of debugging network issues at install sites will probably swamp any advantages during development. This project can benefit from the host of Wifi enabled microcontroller systems, low cost embedded Linux technologies, or cloud technologies aimed at IOT systems. All of these support HTTP just fine.